The ventricular system is a set of four interconnected cavities (ventricles) in the brain, where the cerebrospinal fluid (CSF) is produced. Within each ventricle is a region of choroid plexus, a network of ependymal cells involved in the production of CSF. The ventricular system is continuous with the central canal of the spinal cord (from the fourth ventricle), allowing for the flow of CSF to circulate. All of the ventricular system and the central canal of the spinal cord are lined with ependyma, a specialised form of epithelium. Size and location of the ventricular system in the human head. In more detail, around the third week of development, the embryo is a three-layered disc. The embryo is covered on the dorsal surface by a layer of cells called ectoderm. In the middle of the dorsal surface of the embryo is a linear structure called the notochord. As the ectoderm proliferates, the notochord is dragged into the middle of the developing embryo. As the brain develops, by the fourth week of embryological development three swellings known as brain vesicles have formed within the embryo around the canal, near where the head will develop. The three primary brain vesicles represent different components of the central nervous system: the prosencephalon, mesencephalon and rhombencephalon. These in turn divide into five secondary vesicles. As these sections develop around the neural canal, the inner neural canal becomes known as primitive ventricles. These form the ventricular system of the brain: The neural stem cells of the developing brain, principally radial glial cells, line the developing ventricular system in a transient zone called the ventricular zone. The ventricles are filled with cerebrospinal fluid (CSF) which bathes and cushions the brain and spinal cord within their bony confines. CSF is produced by modified ependymal cells of the choroid plexus found in all components of the ventricular system except for the cerebral aqueduct and the posterior and anterior horns of the lateral ventricles. CSF flows from the lateral ventricles via the interventricular foramina into the third ventricle, and then the fourth ventricle via the cerebral aqueduct in the brainstem. From the fourth ventricle it can pass into the central canal of the spinal cord or into the subarachnoid cisterns via three small foramina: the central median aperture and the two lateral apertures. 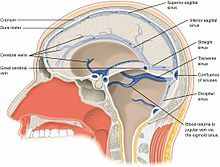 The fluid then flows around the superior sagittal sinus to be reabsorbed via the arachnoid granulations (or arachnoid villi) into the venous sinuses, after which it passes through the jugular vein and major venous system. CSF within the spinal cord can flow all the way down to the lumbar cistern at the end of the cord around the cauda equina where lumbar punctures are performed. The brain and spinal cord are covered by the meninges, the three protective membranes of the tough dura mater, the arachnoid mater and the pia mater. The cerebrospinal fluid (CSF) within the skull and spine provides further protection and also buoyancy, and is found in the subarachnoid space between the pia mater and the arachnoid mater. The narrowness of the cerebral aqueduct and foramina means that they can become blocked, for example, by blood following a hemorrhagic stroke. As cerebrospinal fluid is continually produced by the choroid plexus within the ventricles, a blockage of outflow leads to increasingly high pressure in the lateral ventricles. As a consequence, this commonly leads in turn to hydrocephalus. Medically one would call this post-haemorrhagic acquired hydrocephalus, but is often referred to colloquially by the layperson as "water on the brain". This is an extremely serious condition regardless of the cause of blockage. An endoscopic third ventriculostomy is a surgical procedure for the treatment of hydrocephalus in which an opening is created in the floor of the third ventricle using an endoscope placed within the ventricular system through a burr hole. This allows the cerebrospinal fluid to flow directly to the basal cisterns, thereby bypassing any obstruction. A surgical procedure to make an entry hole to access any of the ventricles is called a ventriculostomy. This is done to drain accumulated cerebrospinal fluid either through a temporary catheter or a permanent shunt. ^ National Institutes of Health (December 13, 2011). "Ventricles of the brain". nih.gov. ^ a b Schoenwolf, Gary C. (2009). ""Development of the Brain and Cranial Nerves"". Larsen's human embryology (4th ed.). Philadelphia: Churchill Livingstone/Elsevier. ISBN 9780443068119. ^ a b Raine, Adrian; Lee, Lydia; Yang, Yaling; Colletti, Patrick (2010). "Neurodevelopmental marker for limbic maldevelopment in antisocial personality disorder and psychopathy". BJPsych". The British Journal of Psychiatry. 197 (3): 186–192. doi:10.1192/bjp.bp.110.078485. PMC 2930915. PMID 20807962. ^ Klein, S.B., & Thorne, B.M. Biological Psychology. Worth Publishers: New York. 2007. ^ Peper, Jiska S.; Brouwer, RM; Boomsma, DI; Kahn, RS; Hulshoff Pol, HE (2007). "Genetic influences on human brain structure: A review of brain imaging studies in twins". Human Brain Mapping. 28 (6): 464–73. doi:10.1002/hbm.20398. PMID 17415783. ^ Allen JS, Damasio H, Grabowski TJ (August 2002). "Normal neuroanatomical variation in the human brain: an MRI-volumetric study". American Journal of Physical Anthropology. 118 (4): 341–58. doi:10.1002/ajpa.10092. PMID 12124914. ^ Galarza M, Merlo A, Ingratta A, Albanese E, Albanese A (2004). "Cavum septum pellucidum and its increased prevalence in schizophrenia: a neuroembryological classification". The Journal of Neuropsychiatry and Clinical Neurosciences. 16 (1): 41–6. doi:10.1176/appi.neuropsych.16.1.41. PMID 14990758. ^ May F, Chen Q, Gilbertson M, Shenton M, Pitman R (2004). "Cavum septum pellucidum in monozygotic twins discordant for combat exposure: relationship to posttraumatic stress disorder" (PDF). Biol. Psychiatry. 55 (6): 656–8. doi:10.1016/j.biopsych.2003.09.018. PMC 2794416. PMID 15013837. ^ Zhang L, Ravdin L, Relkin N, Zimmerman R, Jordan B, Lathan W, Uluğ A (2003). "Increased diffusion in the brain of professional boxers: a preclinical sign of traumatic brain injury?". AJNR. American journal of neuroradiology. 24 (1): 52–7. PMID 12533327. ^ McKee, AC; Cantu, RC; Nowinski, CJ; Hedley-Whyte, ET; Gavett, BE; Budson, AE; Santini, VE; Lee, HS; Kubilus, CA; Stern, RA (Jul 2009). "Chronic traumatic encephalopathy in athletes: progressive tauopathy after repetitive head injury". Neuropathol Exp Neurol. 68 (7): 709–35. doi:10.1097/NEN.0b013e3181a9d503. PMC 2945234. PMID 19535999.